The Left is having trouble figuring out Black Lives Matter. On Saturday, Marissa Johnson and Mara Jacqueline Willaford disrupted a rally to protect Social Security and Medicare featuring Bernie Sanders, taking the microphone and demanding a four and a half minute moment of silence for Michael Brown. Sanders eventually left the stage. For his part, Sanders’s campaign has — likely in direct response to pressure from Black Lives matter — put forward a comprehensive plan to address physical, political, legal and economic racial injustice. He also reportedly opened his rally last night in Los Angeles by giving Black Lives Matter activists a chance to speak. It will be interesting to see if these moves are enough to avoid further disruptions at his events. What will be more interesting, however, will be to see whether Sanders’s supporters are able to avoid the visceral reaction they had on Saturday to being called racists — a reaction that more or less confirmed the charge. Since first being challenged at Netroots Nation, Sanders and his campaign have learned from their mistakes with respect to race and the Black Lives Matter movement. His supporters, on the other hand, have refused to acknowledge that there was a problem in the first place. After all, of all of the candidates in the Democratic primary, Sanders has the best record on civil rights and racial equality. And it isn’t particularly close. This quote from one of the protestors is stupefying. “‘Bernie, you were confronted at NetRoots at by black women,’ (Marissa) Johnson said before adding, ‘you have yet to put out a criminal justice reform package like O’Malley did.’” Just in case you were wondering, that would be Martin O’Malley, the former mayor of Baltimore who put in place much of the aggressive policing tactics that resulted in the death of Freddie Gray on April 12th. The candidate who has stood at the forefront of civil rights advocacy for over fifty years is now being told by Black Lives Matter activists (and liberal columnists) that he needs to be more like, you know, the guy who gave thousands of Black men across his city arrest records for the ridiculously minor legal transgressions. It is a perfect example of the triumph of form over substance in politics. Sanders’s supporters have also (rightly) wondered why Sanders has now been the target of two widely publicized disruptions, while Hillary Clinton, at rallies paid for with funds raised from private prisons, has yet to be challenged. The only two arguments I’ve heard in response to this question are that a) her campaign events have tighter security, making direct action more difficult; and b) that Sanders is more likely to respond to protest in a positive, substantive manner. Neither of these arguments make very much sense, as climate activists have had no problem disrupting Hillary Clinton’s public events, and if she isn’t willing to propose a comprehensive racial justice platform, it would be good to get her on record saying so. What’s more, if the primary allegation against Sanders is that he silences black voices by focusing too heavily on economic issues, wouldn’t Clinton’s heightened security — to the point at which protest is all but impossible — be an even greater act of silencing? At bottom, I think this is one of the greatest sources of frustration among Bernie Sanders supporters. Not that Sanders has been targeted, but rather that Clinton — whose record on racial justice is far worse — hasn’t, allowing her to be the prime beneficiary of the protests. To that point, Black Lives Matter co-founder Alicia Garza said in a Facebook post yesterday that, “Every one of these candidates is going to be pushed. Every. Last. One.” So I guess it’s only a matter of time before Clinton gets her due. In any case, back to Sanders. Wait, that last part was kinda racist, wasn’t it? For the last forty years, Democrats have been tearing their hair out wondering why Kansans don’t vote for them. After all, they totally would if only they knew what’s best for them. Curse those evil Republicans for tricking those doddering stumblebums into voting against their own self-interest! If only people were as easily persuaded by facts and logic as they were by fear and a Southern accent. Of course, that head-meets-desk insistence that Kansans vote our way is part of the reason why they don’t. People don’t like being studied as political oddities, and they really don’t like being told what to do. Kansans look to the coasts and see rich, elite, cosmopolitan liberals dismissing them as idiots for not recognizing the greatness of their agenda. No matter what’s on that agenda, I can’t blame them for not wanting to identify with the people who put it together. They hear us saying “But don’t you want a minimum wage increase?” with an implied “…you idiot” at the end. And I can’t say I blame them for both hearing it and, as a consequence, rejecting the explicit appeal, even if it’s in their interest. Much in the same way, black voters are under no obligation to flock to Bernie Sanders, especially if it means identifying with a group of people who come off less as allies and more as saviors. Regardless as to whether Bernie Sanders is a patronizing white liberal racist, he is #1 with patronizing white liberal racists, even if he also — issue by issue — matches with what black voters say they want in a candidate. That association, more than his actions or his platform, is what’s turned off many black activists this week. It isn’t at all contradictory to say on the one hand that Bernie Sanders is the candidate best suited to address the grievances of the Black Lives Matter movement and admit on the other hand that he and his campaign have been improved by Black Lives Matter protests, which highlighted real, legitimate issues with the way in which he was (not) talking about race on the campaign trail. We can only point fingers at Clinton and O’Malley’s worse transgressions if we first acknowledge that Sanders has room to improve, as well. To insist otherwise — that there was no problem to solve and that the protestors’ actions are illegitimate — is itself justification for the protests in the first place. When you respond to a direct action calling for Bernie Sanders to more forcefully embrace racial justice by saying “It is stupid, don’t do it,” you tell the activists two things. First, that they are idiots. Second, that because they are idiots, they should listen to you and vote for the candidate of your choosing. That is stupid. Don’t do it. Tags: 2016 elections, Bernie Sanders, Elections, Hillary Clinton, protest, whats the matter with kansas? That’s what I was saying; and I’m certainly not applauding. Isn’t “sit down and shut up” what BLM is doing when they hijack events and refuse to allow them to continue as planned? Step back and away from the nonsense. If they are not on board, they are not on board. There is nothing we can do about it. Move on. Does the context really matter when you consider that police (you know, those people who are serving and protecting?) are shooting and killing American citizens at more than triple the rate that Americans were being killed in our last two wars? Trying to say “Oh well, most of them were bad people who deserved it, the cops were just defending themselves” is entirely absurd, when you consider that every other civilized nation in the world has a teeny tiny fraction of the same level of police executions. Make no mistake, that’s what they are. Also, somehow, they manage completely defy the crime statistics and shoot many more minorities? No, we have a serious problem in this country, with violence in general, but also with police being trained to jump to deadly force as a first option. In other words, sit down and shut up. I don’t think that’s going to be received with applause. Maybe it is a “decentralized” movement. If so, that is it’s failing. Anyone can do anything and claim to be doing it in the name of BLM. That tars the whole movement — as well as the cause — with the same brush. If BLM is just a helter-skelter group of individuals all acting on their own agenda, then it’s hard for me to take it seriously. It really is nothing. I believe in the cause, but I think BLM, as currently constituted, is working against the cause and for a group of individual agendas. You don’t accomplish anything that way. My question is, who speaks for Black Lives Matter? Anybody who claims that mantle? I think you have the Pete Seeger crowd in mind. The real left has a slightly different approach. “The Battle of Deputies Run” was fought 80 years ago in downtown Minneapolis … One of the bloodiest clashes in the history of the city, this armed skirmish grew out of the protracted Truckers’ Strike, which consumed Minneapolis during 1934. This conflict between the radical Teamsters’ Union and the powerful Citizens’ Alliance began in February and plunged the city into civil war for most of 1934. … The Citizens’ Alliance denounced the “Red Dictators” who were determined to “starve our city into submission.” They tried to break the strike by luring a group of picketers into an alley where they were beaten with saps and night clubs. But after dozens of protesters were hospitalized, strikers were galvanized. They prepared for armed conflict, organizing for battle in the city’s central market, the nexus of the city’s truck traffic and thus a critical site for both sides. No, I don’t think anyone has real forecasts, except that we’re well past the tipping points and things will get worse. Almost 30% were African-American, so more than double the 12% of the population that AAs comprise. But even if it were in demographic proportion, I find 3 people a day killed by police horrifying. 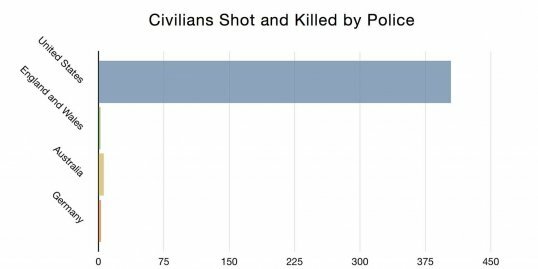 Well, that raw number (which may or may not be accurate–it’s much higher than the BJS figures) doesn’t take into account how many of those people killed were shooting at police, aiming guns at police, shooting at other people, etc. (all valid reasons for police to use fatal force). It also doesn’t take into account the number of police/criminal interactions each day in this country, and it doesn’t give the racial breakdown of that number. Finally, that site (and BLM) never mention the 6,000+ black people killed in the US each year–by other black people (over 500 just in Chicago). Those black lives apparently don’t matter, because they are swept under the rug by BLM. I’m not saying–at all–that things are perfect and that they can’t and shouldn’t get better. But the hypocrisy of BLM is astounding. I can’t think of any explanation that doesn’t sound horrible, because it is horrible that we take that level of violence for granted in our country. Some European news sites (at least some Spanish, Italian and Dutch news outlets) today & yesterday have front page stories with the numbers from the database compiled by FatalEncounters.org. Why? The numbers are in and there have been 1,089 people killed in encounters with police in the USA in the last year. That’s an average of 3 people a day. 1,089! I knew, and I think we all knew, it wasn’t just Michael Brown and Freddy Gray, but this number is really goosebump-inducing, make-the-hairs-on-the-back-of-your-neck-stand-up, shocking! So why isn’t this being reported in any of the American media that I can see? Of course the left will oppose it tooth and nail. And write folk songs about it. We’ll all sing them, they’ll be real pretty. Maybe Bruce Springsteen will have a concert about that. But will that stop enforcement once enforcement becomes the government priority? I think that’s doubtful. The public disinformation and propaganda machine is very powerful. First, Black Lives Matter is a decentralized movement, like Occupy. While its leaders were not directly involved in Saturday’s protest, they have endorsed it. Second, Marissa Johnson having a Sarah Palin button on her backpack when she was in high school doesn’t mean she’s a GOP operative today. She’s my age, and I know PLENTY of people from my high school who are more than ashamed of their support for Palin seven years ago. Her parents were right-wing Tea Partiers; it’s what she grew up with. She has since moved on. Her politics are now off-the-charts left. Third, this post really, really isn’t addressing Johnson. She’s mentioned up top, and that’s it. It’s addressing the discourse she’s sparked, one in which self-described liberals have said some awfully patronizing things to black activists who may or may not be directly affiliated with Black Lives Matter. Discrediting Johnson simply isn’t relevant to the argument I’m making, regardless as to her affiliations or motives. Your link to the “apology” is a link to an unofficial Twitter account in Seattle. People claiming to be national leaders defended the assault on Bernie and defended Outside Agitator 206 operatives. I agree that environmental factor are going to have increasingly and unstoppable effects on us. Liberals don’t identify that way, but I think it’s a more accurate way of identifying them. I think the right turn of the Democrats is not a ‘drift’ more like a serie of extreme wrenching motions and that’s it’s getting worse. NAFTA,TPP, gutting welfare, busting unions, fracking, endless wars, NDAA – the list goes on and on. As for HRH HRC or any other Republican administering the American police state the left will oppose it tooth and nail. Johnson, listed on a Facebook page as the contact person for the Westlake Park protest, told black radio station TWiB Monday night that she is a devout evangelical Christian who had supported Sarah Palin in high school. I’ve never known a EuroAmerican liberal to self-identify as that but I know precisely what you said there. Thought I’m not sure the drift to the right is actually a drift to the right so much as it is a tacit endorsement of the neo-isolationist embrace of austerity. Regardless of those quibbles, my concern is an echo of my ecological concern: given the harshness of the situation, how do we survive? As to the flooding in the streets of Miami, gondolas come to mind but we’ll probably settle for kayaks. As to the rise of the police state, Kafka comes to mind. That might not be as helpful as we’d like, but that’s what comes to mind. I’m not opposed to settling for Hillary, she can veil a police state and make it work better than anyone else showing up on the slate. The Obama regime, according to the ACLU, has put Black Lives Matter on its enemies lies. “One year after Michael Brown’s death at the hands of law enforcement in Ferguson, many #BlackLivesMatter organizers continue to drive the movement for justice standing up for the lives of Black men, women, and children wherever and whenever injustices occur. Despite the heroic efforts of many activists, it was recently uncovered that the U.S. government is surveilling the #BlackLivesMatter movement tracking its activity online. Here’s the link to the ACLU on this matter and you can sign their petition: https://action.aclu.org/secure/stop-surveillance-of-blm-activists?emsrc=Nat_Appeal_AutologinEnabled&emissue=criminallawreform&emtype=petition&ms=eml_150806_criminallawreform_blmsurveillance&__af=BM7nXTpGfDpxJHW94v5xQ1Ism4%2FLKRRBNuob0Cls4ran7e1%2FvtiLi4ThxccKuyd9jB9aSqsPJNdyEm13npXqwrTN0T8yTueWwRJevK3%2FGp%2FyVdKm%2BFtVLy0rD%2BwaiL8AiO1WKy8iFRNR1%2FUmLjxyXWRx6FIMEkAJ5y9yaPqC%2FnG0wORZbui1NmvCY8%2BR82mQPUysQu5l0yLzDpDkj5uxB5lA2EBI8BQZQjjgU7zIrP%2BpzcnQcJc1OSw9WIc70U5pGBxLNZcP1SbPvK9o%2BBEttQ%3D%3D. Sanders is a Democrat and their leaders and owners run one of the two parties of racism that refuse to do anything real about cop killers and institutionalized racism. Moreover they and their Republican counterparts conduct racist wars of aggression and, despite what they say, engage in extremely aggressive persecution of immigrants. Obama has destroyed the lives of over 2,000,000 immigrants and imported workers by deporting them. BS is a rabid supporter of the zionist colony in Palestine which is racist at it’s core and practices mass murder like they did in Gaza about this time last year, an apartheid system much worse than that in South Africa and which rests on stolen land. Looked at from another point of view EuroAmerican liberals thought the election of Obama would put an end to impulses for black nationalism but it didn’t. the Continuous uprising centered around killer cops and the fact that Obama regime refuses to arrest and prosecute them means that black nationalist and left sentiments will grow by leaps and bounds. All the candidates of the right wing Democrat, Libertarian and Republican parties will suffer from that and that includes Obama imitators like BS and HRH HRC. And finally, liberals and social democrats are not part of the left. They’re Democrats and that party, which was once centrist, has been moving further and further to the right with each passing year. You need to do some research into who is really behind BLM. They are not what they seem. Check out Outside Agitators 206. That’s the group Marissa Johnson, former Sarah Palin supporter and GOP operative, is associated with. There may have been disruptions at Hillary rallies, but not to the point of rushing the stage, seizing the microphone, and roughing up the candidate. The ones they should be protesting the GOP candidates, but security for those candidates would have no qualms about tazing the “agitators” asses — and they know it. Bernie is the softest target. and that’s how you loose the election. I think one of the disturbing trends we see is that people are grouping the BLM protesters with the entire black community. When Dan Choi chained himself to the White House, it was polarizing in the gay community, and there have been many articles written since the interruptions of Bernie Sanders with a similar dichotomy from within the black community. The left’s response has often grouped all black constituencies together with BLM, and that’s not helpful or accurate. It betrays a lack of understanding that only further fans the flames. I am a Bernie supporter, but I’m disappointed at best with his reactions to these protests. When someone clearly has a grievance, you don’t just ignore them or draft solutions without them, you ask them to have a dialogue. I know that many of us on the left are die-hard Bernie supporters, and even questioning him and his actions seems traitorous, but we need to allow for the reality that he’s not perfect, that he has a number of policies that are not ideal, and that the only way to overcome those imperfections is through dialogue. and if Bernie wants to lead, he has to be the person to start those dialogues. 1.”As previously reported by iPolitics, attendance at a Harper event is by invitation only. 2. “Ahead of the October federal election, it has banned people attending Stephen Harper events from posting messages or photographs to social media, iPolitics reports. “Holder (of the confirmation of registration) is prohibited from transmitting or aiding in transmitting any description, account, picture or reproduction of the Event,” reads information related to an event scheduled for August 10. When the protester that seized the microphone has is a radical christianists who complains about how the GOP should have picked her up and “groomed” her after she wore a Palin button in past campaign cycles and has a record of being a christianist nutcase ( redunant) and has posts on her facebook page stating this I smell a rightwing whack job trying to get a payday from the Koch Bro. Kudos to the leaders of BLM stating that she should apolagize and stop pretending to act in their name. Now this is a “false flag” operation.